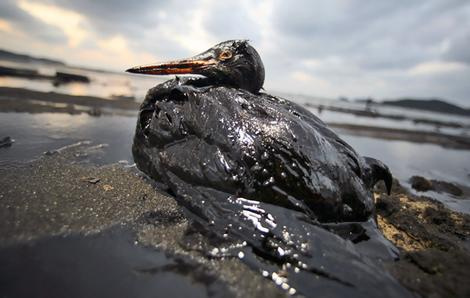 As of this moment somewhere north of 85 Million gallons of oil has been leaked into the gulf. Depending on whose numbers you take on either spill this is from 3 to 15 times the amount spilled by the Exxon Valdez. Over the course of several disasters, natural and otherwise, nothing is being learned. Or rather, an amount is being learned, but that learning is not being applied. Prior deficiencies have not been rectified, prior mistakes are being repeated. For conversion purposes: A Barrel (bbl) of oil is 42 gallons, so the lowball setting on the widget of 1.47M gals/day equals about 35,000 bbl. High estimate last I heard was 60k bbl or about 2.5M gals. One possible reason BP is lowballing estimates, and I’d bet it’s a large concern, is that civil penalties carry a price per barrel of $4300. On the low side of 35k bbl that comes to $150.5M per day. Louisiana residents 45 miles off the Gulf of Mexico claim to have videotaped an oily substance raining down. Worst case scenario? It’s petroleum mixed with Corexit, the cancer-causing dispersant BP’s spraying on its oil slick. Best case scenario? Dirty roads. [Corexit] is associated with headaches, vomiting and reproductive problems as sides effects at high doses to clean-up workers. 2-BE has also been documented to cause the breakdown of red blood cells, leading to blood in urine and feces, and can damage the kidneys, liver, spleen and bone marrow of humans – effects not included on the information sheet for workers. The full article is here and worth a read.